My uncle made a jicama tangerine salad a while ago, and I was really sad that I missed it. 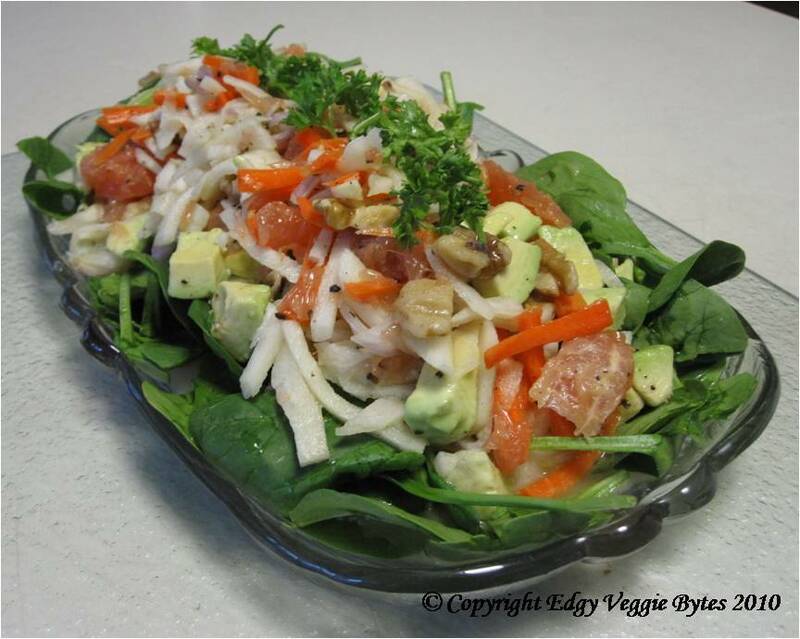 Since I bought a jicama and we had grapefruit at home, I decided to make a variation of that salad. I was hesitant at first, because the salad had raw jicama in it. But it turns out that it tastes really good- kind of like a crunchy apple mixed with a potato. This may be one of my new favorite salads! 1. Prepare the jicama- Using a knife, peel the outer layer of skin away and discard (a potato peeler doesn’t work well for this). Cut the root in half. Cut each half into thin slices. Cut the slices into thin strips (~1/8 inch). 2. Prepare the grapefruit- Peel the skin off the grapefruit. Then peel the segments apart and separate them from the thin membranes that cover them. Discard the skin and the thin membranes. Cut each grapefruit segment into thirds. Keep whatever juice comes out. 3. Mix the jicama, grapefruit (segments and whatever juice came out), lime, salt, pepper, and olive oil in a large bowl and let it sit for ~1/2 hour. Namita….that looks really yummy. Next time you make it call me & I’ll drive 3 hrs just to eat it. U know me I’ll drive miles and miles for good food!!!!! I have no comment….why, you ask? Because there were no leftovers for me! Yum! I made this salad tonight for dinner and it was FABULOUS! So light and refreshing. I’m excited about the left-overs I have for lunch tomorrow. ..Oh, and because I am obsessed with spicy food I added a finely chopped jalepeno (seeds removed) for a little ‘heat’. Currently this is my favorite salad! Hope you are feeling better and had a great weekend.